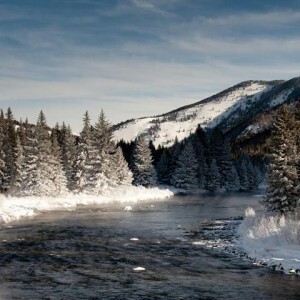 Are You Ready For Winter Fly Fishing On The Gallatin River? Many people believe that fly fishing is only a summer activity, but they're wrong. In Big Sky, Montana, you can fly fish all year long. Grab your gear, hire a guide, and go winter fly fishing on the Gallatin River. It's a wild experience that everyone needs to try - just be aware that you might get hooked. Whether you’re looking for a way to rest your legs after a week of skiing at Big Sky Resort or Lone Mountain Ranch or you want to enjoy the calming effects of the great outdoors, winter fly fishing on the Gallatin is the way to go. When you're in our mountain town, you're only steps away from world class fly fishing. Watch The Weather - While you can fish every day, be aware that winter can bring harsh weather patterns to Big Sky Country. Pay attention to temperature, cloud cover, snow, and wind as these variables can affect your enjoyment of the day. Dress For The Day - Standing in the Gallatin River is cold. Invest in quality waders and gear. Wear lots of layers so that you stay warm when it's cold outside. Select The Right Flies - While there may not be a hatch during the winter, you’ll still want to stop by a local fly shop to ensure that you have the right flies. Know The Water - It’s important to understand the waters on the Gallatin so that you can increase your chances of catching a big fish. Hire A Guide - The best thing you can do is hire a fly fishing guide from a reputable outfitter. These fishing gurus know the waters, the fish, the flows, the flies, and everything else you need to know about how to have a good time on the Gallatin River this winter. 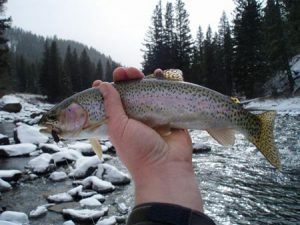 Check out Gallatin River Guides, Lone Mountain Ranch, or Wild Trout Outfitters, to book your winter fly fishing trip. The Greater Yellowstone Ecosystem provides some of the best fly fishing in the world. An abundance of water means that you can fly fish year round. One of the best times to hit the rivers and avoid the crowds is during the winter season. If you're looking to disconnect and find a bit of solitude in the SW Montana winter wonderland, go winter fly fishing. It's a blast.